Found a Cat or Kitten Outdoors? Here’s What to Do! Here in Texas, kitten seasons is typically at its height between April and October. During these months, you’re more likely to find free-roaming kittens and adult cats. Depending on the age, temperament and health of the cat or kitten, Palm Valley Animal Center has different options to help. Here’s your definitive guide to helping found felines in Hidalgo County. Kittens from birth to six weeks: Kittens do best when raised by their mothers and although PVAC offers some programs to help orphaned kittens, if you find a litter of healthy, young kittens that are in a safe location like in a yard, the best thing you can do is leave them alone. If they’re healthy, it means mom is nearby and will soon return to care for them. Kittens six to 12 weeks: These kittens can also be brought to PVAC, but because we operate at capacity year round, keeping kittens in this age group out of the shelter is truly lifesaving. 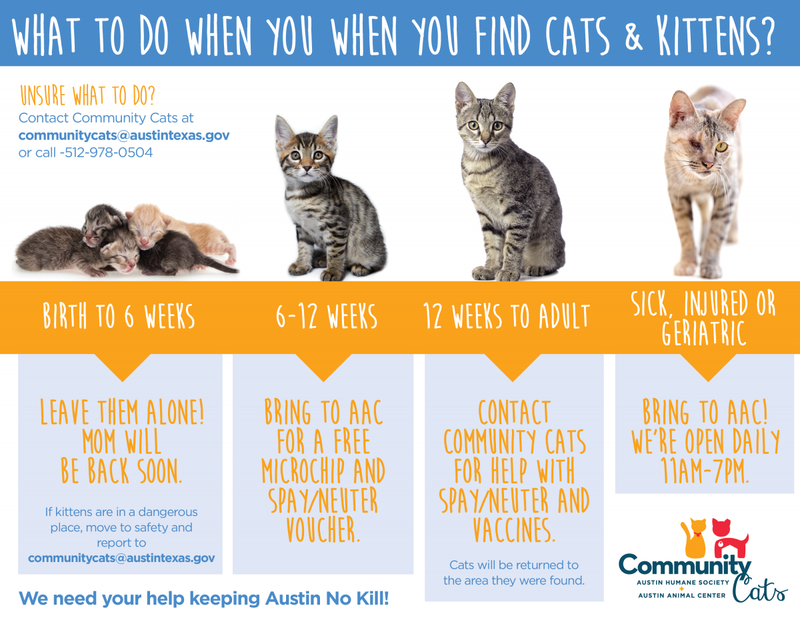 Kittens and Cats 12 weeks to adult: If you find a stray cat or kitten that is friendly, you can bring take it to your veterinarian clinic or to PVAC to be scanned for a microchip, while there drop off a Found Pet Flyer, click here for a sample flyer. If it’s a feral cat (non-social, fearful cat), we recommend that you trap-neuter and return it (TNR) to where it was found. Sick and injured cats and kittens of any age, geriatric cats or cats in immediate danger: If you see a cat that is sick or injured (lethargic, limping badly, appears dehydrated or emaciated, has been hit by a car or has open wounds or sores), please seek medical attention, click here for list of local veterinarian clinics. Sign up to join our Kitty Committee.